Steyning Community Orchard News October 2018: Apple Day goes ahead in spite of the weather. Apple Day goes ahead in spite of the weather. 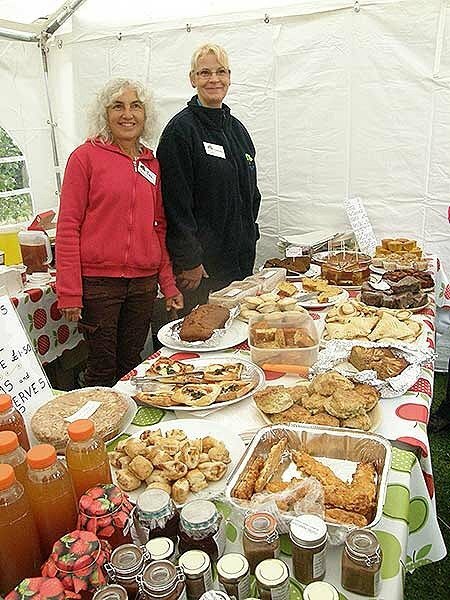 Steyning Community Orchard’s surprising run of good luck with the weather came to a soggy end on Saturday 6th October when Apple Day was marred by heavy and persistent rain. This did not stop an enthusiastic band of volunteers from setting up marquees and gazebos so that the event was able to go ahead in spite of the worst the weather could do. Visitors who braved the rain were treated to all the usual activities and the tents were crowded from start to finish. A large, sturdy, new marquee, obtained with a donation from the Rampion Fund meant that there was plenty of waterproof space available. Apple pressing at the Apple Day event is now highly efficient and gives Steyning residents a chance to have some of their apples turned into juice. Lots of people turned up with bags and boxes of apples and the team of volunteers set to work on them. The orchard group have two apple presses, two scrutchers (for pulping the apples ready for pressing) mounted on sturdy trestles and so there were two production lines working on the day pressing apples that people had brought along. Children love having a go at turning the handles and working the presses. They also enjoyed the children’s activities organised by Ronnie Reed, including painting and apple bobbing. They could also have their faces painted by Deniz. Later in the afternoon Ronnie held them in rapt attention as she told them a story. Roger Brown had collected over 50 varieties of apple to display, including many Sussex heritage apples, reminding us all that there are many more varieties of apple than the few that we find in the supermarket. There was also information about the Orchard group’s activities and the orchards and fruit trees of Steyning. The refreshment stall was organised by Sarah Sullivan with tea, coffee and apple juice on sale and a mouth-watering display of home-made cakes and treats, all made by our volunteers and supporters. As you might expect, most of them involved apples in the recipe. The apple juice was pressed from donated local apples. Other refreshment was provided by Riverside Brewery who were offering one of their special beers and local cider. Simon Zec acted as master of ceremonies, introducing the activities that made up the afternoon. Music was provided by three groups, including Pete Varkala who once again provided the sound system and the Cheer-up Mollies. All the cakes sold, the beer barrel was emptied, and all the apples pressed into juice. The event came near to being cancelled because of the weather, but in the end all agreed that the right decision was to go ahead make the most of it. We are now looking ahead to our Wassail on Saturday January 19th. But more about that in a later Your Steyning.